Ever experience lower leg fatigue from being on your feet all day? As nurses, you save lives, but at the expense of your legs. Many nurses think the fulfillment of their job make it worth it if it means another saved, healthy life. But, still. Those calves are sore, aren’t they? There’s an easy way to avoid this. They’re called compression socks. Compression socks can help to keep circulation pumping through your lower legs that’ll help prevent fatigue, cramps, or even overwrought veins. I’m here to show you best compression socks for nurses so you can worry less about your achy legs and more about your patients. Compression socks apply a certain amount of pressure, usually graduated up the leg. This compression offers many benefits to users who spend a lot of time on their feet all day. Yup, I’m looking at you, nurses. Increased circulation of blood and oxygen through the legs. This helps keep blood clots from forming in your deep leg veins. This circulation also helps to remove lactic acid from building up in the muscles. Tension does not accumulate in your calves either, relieving stress and pain. Limits/reduces swelling. The circulation of blood through the legs keeps swelling to a minimum and can even eliminate swelling problems in the legs from standing too long. Relieves symptoms of and prevents problems of varicose veins, skin ulcers, and deep vein thrombosis. These are common conditions of nurses who spend 12+ hours on their feet all day. Bulging veins can make you feel self-conscious and uncomfortable. The blood circulation aided by compression socks can help prevent this problem. Many people wear compression socks all day long and find that it helps immensely with eliminating any discomfort. You’ll want to take them off at night when sleeping. Those long shift hours are when you want to make sure to wear these socks/sleeves. Convinced that compression could work for you? 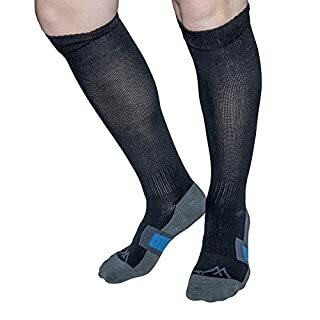 Nurses are encouraged to begin wearing compression socks from the beginning of their careers to prevent problems of swelling legs, varicose veins, etc. So, which ones are good? That’s what I’m here for. I’ve reviewed the top compression socks for nurses to help you make a well-informed decision before you buy. Don’t you just love when someone does the hard work for you? These support socks for nurses by Wanderlust didn’t make it to the top of our list for no reason. These are rated as the best brand of compression socks by both men and women who find them comfortable, supportive, and high quality. Anti-embolism and circulatory design compress the leg in a perfect measure without constricting. They fit perfectly with no bunching, no rolling, and no deep red marks in the calf. These socks are breathable and made with extra soft foot padding which helps to absorb the impact of your step. The toe box is made seamless with materials that prevent friction, blisters, and corns. Pair these with your favorite nursing shoes – both your legs and feet will thank you. EvoNation made these stylish compression socks for women. They feature proprietary graduated compression zone technology and copper infused fibers. 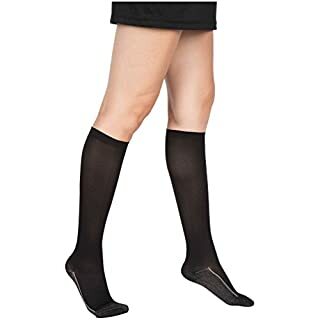 Their compression zone technology applies pressure where it’s needed, making these socks some of the best support stockings for nurses around. Copper infused fibers help eliminate odors. Both make the sock durable, supportive, and comfortable. They stay put on your calves without marking them red. Many like the way they look as well. Whereas the Wanderlust socks have a sporty look about them, EvoNation’s socks have a classic look that’s wearable with any outfit. This company takes a lot of pride in their micro-scaled compressive knit patterning. Users attest that this improves the quality of the sock. Another great contender is the cool compression socks from BEST Graduated Athletic Fit. They are made with antibacterial fabric, moisture wicking properties, and breathable materials. 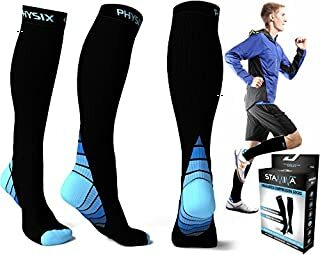 While other brands are tailored to women, these are great compression socks for men. Quality stitching with lycra fabric makes these long-lasting. Stay put cuffs keep the socks in place on your legs. Users may also enjoy the soothing feel at the bottom of the feet while wearing these. A great plus when purchasing these socks is the customer service. Don’t be surprised if, after purchasing, you receive an email asking how your socks are doing for you. Companies that follow-up on purchases are of top quality. Looking for more color options? 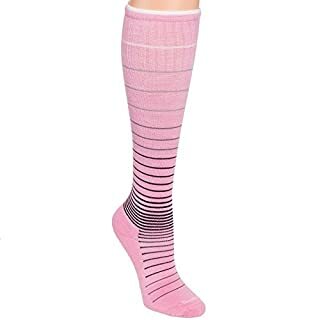 Sockwell has a great selection of colorful compression socks that provide a moderate amount of compression- 15-20 mmHg. These are made with Accu-fit technology which provides durable wear throughout the day. A seamless toe closure keeps the sock in place as well. The cushioned sole is light with the most pressure happening where you need it most. Don’t let the low compression numbers deter you. 15-20 mmHg will provide enough relief for women nurses on their feet all day. Because these are made with superfine merino wool, some may find these too warm for the summer months. But as hospitals are usually pretty cold, I imagine this to be a minor issue for nurses. To end the list, we give you a sleeve option. Some nurses don’t like the added constriction on their feet with compression socks. 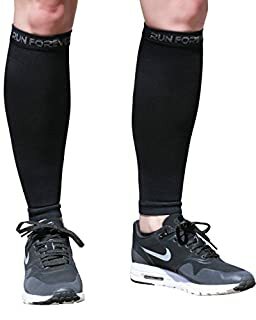 Compression sleeves are a good alternative. Users like how thin these are compared to most compression sleeves, but don’t mistake that for low-quality. These sleeves are supportive without being constrictive. They provide a good level of compression (15-20 mmHg) to keep your legs comfortable and free of pain. They also come in a variety of colors, with bright options like orange and pink. Maybe no one will see them, but you’ll feel good about wearing your favorite color. This brand also follows up on your order showing excellent customer service and a brand who cares. They’ll happily send you a different size or refund if you’re dissatisfied. So, did you find your favorite pair? Any brand you decide will give you top quality compression socks and sleeves that can keep you on your feet and moving with vigor. Some never knew compression could be so helpful. Now that you do, you have no excuse for achy, swelling ankles and legs. No more worrying about your legs. Put that attention to good use for your patients.